Welcome to our new location! Our mailing address is the same, but our location has changed to 6510-A NE Columbia Blvd. Portland, OR 97018. We’re sharing pictures in this issue and hope you’ll be as excited as we are. 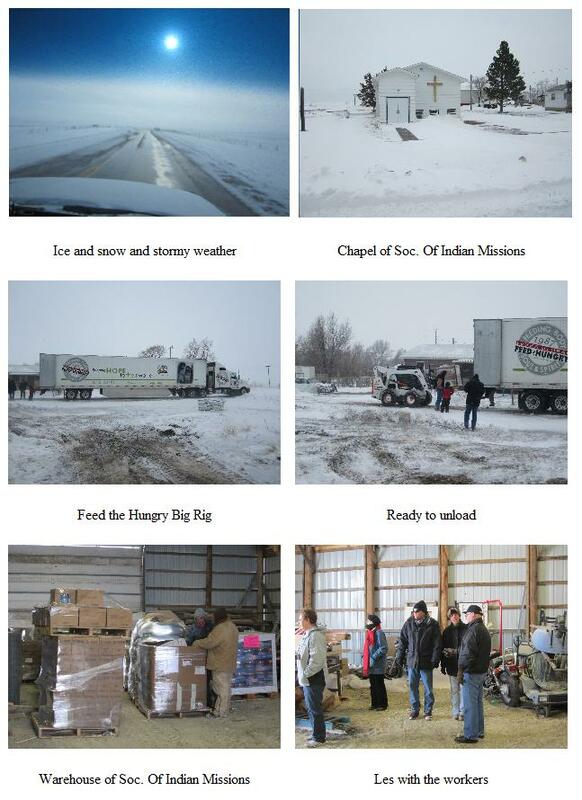 We’re also showing you pictures from Les’ trip to the Pine Ridge Reservation in South Dakota to partner with Feed the Hungry once again, and hand out food. Even though the trip took place in May, it looks like December because of the terrible weather they were having back there. The Big Rig couldn’t be taken to some of the drop-off locations because the roads were too bad. 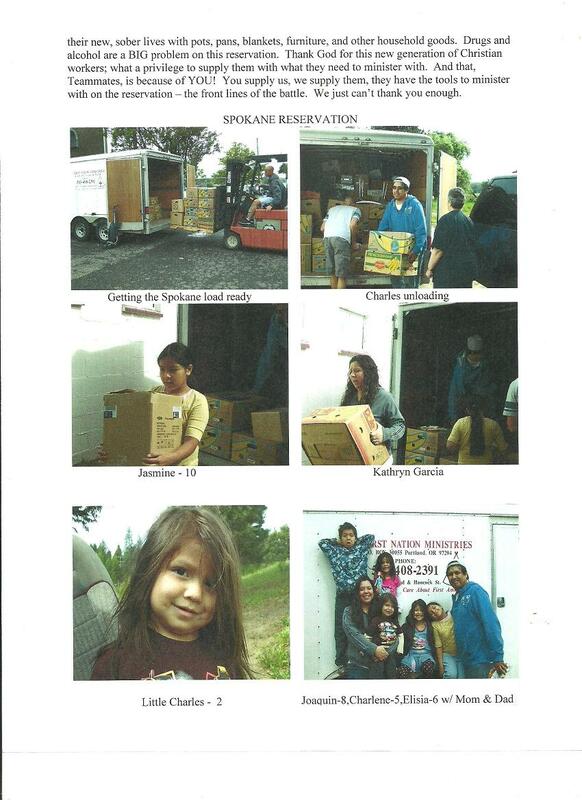 Then we packed a load for the Spokane Rez, where Charles and Kathryn Garcia are pastoring, and Jeff Phipps and his wife, Sharee, took it up to them. These two young couples had a good time fellowshipping together and Jeff was impressed at the vision Charles has for his church and the people there. We are delighted to help supply the food bank, the clothes closet, and the church library for them. 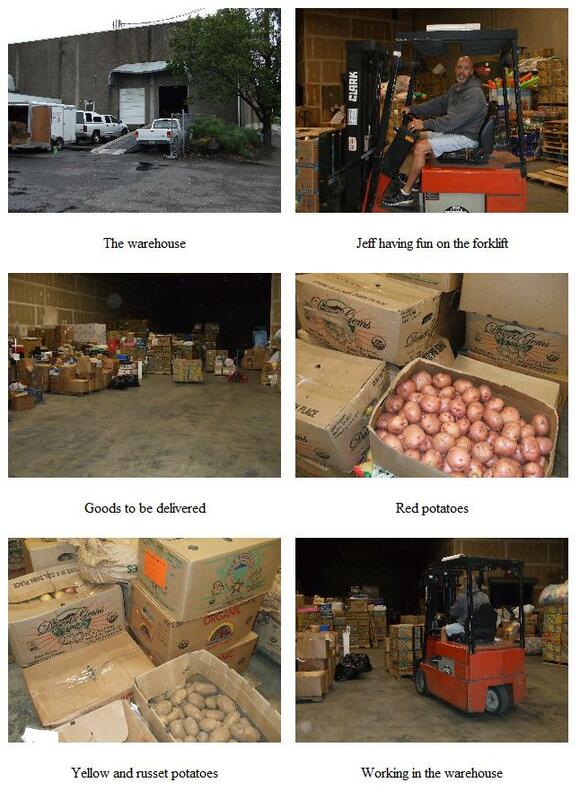 We also received two pick-up truck loads full of potatoes (red, yellow, fingerling, russet, and bakers), onions, and grapefruit from a long-time teammate. This food is organically grown. When the Lord supplies, it’s always good stuff! So, we loaded the bed of the RAM truck with produce for the Garcia’s. We thank the Lord for “enlarging our territory” (I Chronicles 4:9-10), but with that blessing comes added expense. That’s where you come in, Teammate. Thank you for all your prayers and financial support that makes this work possible. Keep it up! Get in on the giving and you’ll get in on the blessing because you can’t out give God. I remind you of Psalm 41:1: “Blessed is he that considereth the poor: the Lord will deliver him in time of trouble.” We will be going to Celilo and Colville next, the Lord willing. Please pray for these trips and God bless you “real good”. With Jeff doing the most work, we finally got moved into the new location. He worked hard and, thankfully, Alan Baumgarden gave us lots of time to get out of the chapel, so with the help of Deborah and Bob King, the move is complete. How nice to have room to spread out and see exactly what we have. A note from the web-master: We have experienced a bit of difficulty with our computers due to the recent move. Please accept our apology for the quality of some pictures. 1. Many years ago, Al Capone virtually owned Chicago. Capone wasn’t famous for anything heroic. He was notorious for enmeshing the windy city in everything from bootlegged booze and prostitution to murder. Capone had a lawyer nicknamed “Easy Eddie”. He was Capone’s lawyer for a good reason; Eddie was very good! In fact, Eddie’s skill at legal maneuvering kept Big Al out of jail for a long time. To show his appreciation, Capone paid him very well. Not only was the money big, but Eddie got special dividends as well. For instance, he and his family occupied a fenced-in mansion with live-in help and all of the conveniences of the day. The estate was so large that it filled an entire Chicago city block. Eddie lived the high life of the Chicago mob and gave little consideration to the atrocity that went on around him. Eddie did have one soft spot, however. He had a son that he loved dearly. Eddie saw to it that his young son had clothes, cars, and a good education. Nothing was withheld; price was no object. And despite his involvement with organized crime, Eddie even tried to teach him right from wrong. Eddie wanted his son to be a better man than he was. Yet, with all his wealth and influence, there were two things he couldn’t give his son—he couldn’t pass on a good name or a good example. One day, Easy Eddie reached a difficult decision. Easy Eddie wanted to rectify wrongs he had done. He decided he would go to the authorities and tell the truth about Al “Scarface” Capone, clean up his tarnished name, and offer his son some semblance of integrity. To do this he would have to testify against the Mob. So, he testified. Within the year, Easy Eddie’s life ended in a blaze of gunfire on a lonely Chicago street, but in his eyes, he had given his son the greatest gift he had to offer, at the greatest price he could ever pay. Police removed from his pockets a rosary, a crucifix, a religious medallion, and a poem clipped from a magazine. The poem read: “The clock of life is wound but once, and no man has the power to tell just when the hands will stop, at late or early hour. Now is the only time you own. Live, love, toil with a will. Place no faith in time, for the clock may soon be still”. 2. World War II produced many heroes. One such man was Lt. Com. Butch O’Hare. He was a fighter pilot assigned to the aircraft carrier Lexington in the South Pacific. One day his entire squadron was sent on a mission and after he was airborne, he looked at his fuel gauge and realized that someone had forgotten to top off his fuel tank. He would not have enough fuel to complete his mission and get back to his ship. His flight leader told him to return to the carrier. Reluctantly, he dropped out of formation and headed back to the fleet. As he was returning to the ship, he saw something that turned his blood cold; a squadron of Japanese aircraft was speeding its way toward the American fleet. The American fighters were gone on a sortie and the fleet was all but defenseless. He couldn’t reach his squadron and bring them back in time to save the fleet, nor could he warn the fleet of the approaching danger. There was only one thing to do. He must somehow divert them from the fleet. cameras mounted on his plane told the tale. It showed the extent of Butch’s daring attempt to protect his fleet. He had, in fact, destroyed 5 enemy aircraft. This took place on February 20, 1942, and for that action Butch became the Navy’s first Ace of World War II, and the first naval aviator to win the Medal of Honor. A year later Butch was killed in aerial combat at the age of 29. His home town would not allow the memory of this WW II hero to fade, and today, O’Hare Airport in Chicago is named in tribute to the courage of this great man. So, the next time you find yourself at O’Hare International, give some thought to visiting Butch’s memorial displaying his statue and his Medal of Honor; it’s located between Terminals 1 and 2. Now, what do these two stories have to do with each other? Edward “Butch” O’Hare was Easy Eddie’s son. Oh, Great Spirit, whose voice I hear in the winds, Whose breath gives life to the world, hear me. I come to You as one of Your many children. I am small and weak; I need Your strength and wisdom. May I walk in beauty; make my eyes ever behold the red and purple sunset. Make my hands respect the things You have made and my ears sharp to Your voice. The lessons You have written in every leaf and rock; make me strong-----! Not to be superior to my brothers, but to fight my greatest enemy…myself. When care is pressing you down a bit, rest, if you must – but don’t you quit! Don’t give up, though the pace seems slow – you might succeed with another blow. And he learned too late, when the night slipped down, how close he was to the golden crown. So stick to the fight when you’re hardest hit – it’s when things seem the worst that you mustn’t quit.